Doing homework is one of the things children just hate to do. Most of the time, they put off finishing their homework because they think it’s a tiresome task that will take them hours to finish. Kids naturally want to have fun; they will choose playing games over doing tedious assignments any day. Many things compete for their attention, from TV shows and video games to mobile phones and Internet. To the eyes of children, there are numerous other more interesting things than homework. Their idea of fun is not racking their brains over math problems or spelling assignments. As a parent, your role is crucial in shaping your child’s study and homework habits. You’d want him to develop good study habits and do his homework diligently. However, constantly punishing, nagging, or arguing with your stubborn kid rarely works for long term, and such methods only cause more resistance, whining, and complaints. Follow the steps below to set up a homework routine and encourage your kid to finish his assignments satisfactorily every time. Step 1: Establish a homework routine on the first day of school. Creating a regular homework routine that involves when and where assignments should be done is essential. Students greatly benefit from clear structures for completing homework. It’s often easier to accomplish tasks when they are tied to certain routines. If possible, implement a homework routine as soon as school starts. However, it’s not yet too late even if it’s halfway through the school year, as long as you’re consistent with your daily setup. After a few weeks, the routine will become embedded in your child’s typical activities, and he will naturally get used to doing his homework. A good homework routine reflects your child’s unique learning style. Students with a weakness in focusing attention usually work best when they spend only up to 15 minutes on a certain subject, move on to the next subject for another 15 minutes, and then go back to the previous assignment. This is a more productive approach than forcing your child to work continuously on the same homework. On the other hand, some students accomplish things better when they spend half an hour on homework, take a short break to eat snacks or play, and go back to completing the assignment. Different approaches tailored to a student’s individual needs are necessary. To find out which homework routine is best for your child, talk to him and ask about his preferences. You may also try out several approaches and observe which ones produce effective results. 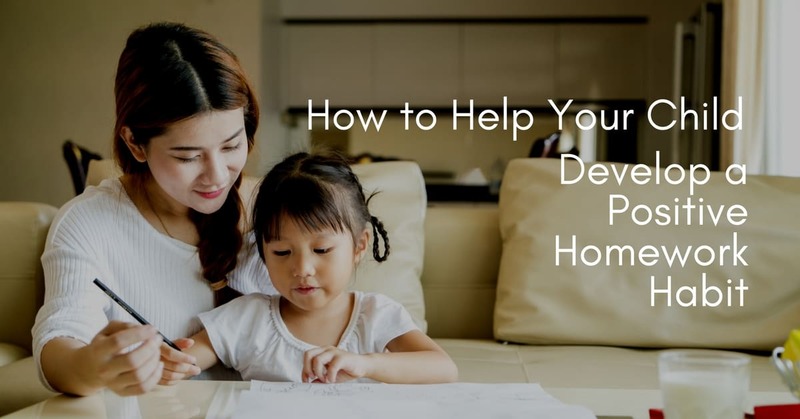 Step 2: Find a suitable space in your home where your child can do homework. The right location depends on your child’s preferences. Some kids find it comfortable to work in their rooms, where the quiet ambiance promotes concentration. Others are easily distracted by playthings in their bedroom, so are likely to perform better at a location with fewer distractions, such as the dining room table. Some children love to sprawl out on the living room floor when doing homework. Ask your child about where he’ll feel most relaxed to accomplish school assignments. Ideally, the location should be quiet, clean, and free of distraction, allowing your child to stay focused. The homework space should also be comfortable and inviting. If it’s always noisy at home, suggest the use of noise-canceling headphones. If your child finds it more relaxing to listen to mellow music, try playing moderate music in the background. To pick the right location, discuss the pros and cons of available choices. It’s important to reach a decision that both you and your child like. Step 3: Create a homework center. After identifying the location most conducive to completing homework, the next step is to set it up as a homework center. Ensure that the workspace is roomy enough to accommodate all necessary materials for doing assignments. Find out the types of supplies he typically uses, and provide basic supplies, including pencils, pens, papers, colored markers, and rulers. A dictionary, thesaurus, and calculator may also be necessary. Depending on the grade level and particular needs of your child, you may also let him use a computer or laptop. Additionally, buy a portable crate where the supplies can be stored if the homework center serves other purposes. Place a handy bulletin board where you can hang a monthly calendar for keeping track of long-term assignments. Allow your child to participate in designing the homework center. Let him share his creativity in improving the place, so he can feel more comfortable and excited to do assignments in his chosen area. However, make sure the homework center doesn’t become excessively cluttered with unnecessary materials. Ban video game consoles, mobile devices, and other distractions until the homework is done or until break time. Step 4: Choose a homework time. It’s essential to establish a particular time for doing homework every day. Your child should be able to get used to this schedule until it becomes a normal daily routine. Some students need one or two hours of break after school to have a snack and enjoy some exercise, while others perform better when starting homework immediately upon arriving home. Again, discuss this with your child, and talk about the advantages and disadvantages of different homework periods. Usually, the best time to tackle homework is before dinner. It’s also good to do homework after dinner when children feel full and their energy levels have been replenished. However, avoid doing assignments later in the evening, because your child may feel too exhausted to think. Step 5: Set a regular homework session. At the start of a homework session, sit alongside your child and draw up a schedule for the day. It’s best to create a daily homework planner that clearly specifies the amount of time allotted for each assignment. It’s your role to review each assignment and ensure that your child understands everything. Let him estimate the amount of time he needs to complete assignments. Ask which one he’d like to do first, and find out if he needs help with anything. This will allow you to adjust the time of completing homework accordingly. Working on assignments continuously can quickly drain your child physically and mentally. Let him decide when he’d like to take a break, and include his chosen break periods in the daily homework schedule. Some kids like to take a break at particular time intervals, such as every 15 minutes or every half an hour, while others prefer to take a break once they finish an assignment. Identify the length of each break period and what your child can do during the break, such as having a snack, watching TV, or playing a game. Step 7: Convey your expectations and set limits. When setting limits and creating rules, tell your child that homework should be done at the same time and same area every day. Moreover, let your child know what you expect from him. You can establish mutually agreed written expectations to make everything clear from the start. You may want to impose certain consequences if the written rules are not followed. For example, if he intentionally fails to complete all of his assignments on a given day, you’ll have to confiscate his video games temporarily until he gets back on track. However, avoid giving a harsh lecture if he doesn’t follow certain rules, and don’t punish severely. Remember that developing new behaviors and habits takes time and proper guidance. Simply remind him about what’s in the written expectations, as well as the consequences of not adhering to them. Mark your homework calendar for each day of successful completion of assignments, and offer rewards and incentives on certain days. For example, you may want to create a mystery box of treats and toys and allow your child to grab inside the box a few times a week. Other possible incentives include access to electronics, playtime with friends, or purchase of new video games at the end of the month. With a proper homework center, a regular schedule, and clear rules, you’ll be able to reinforce a positive and long-lasting habit. Make sure to communicate clearly, and try to make homework a fun experience rather than a chore. By working alongside your child and guiding him well, you can encourage him to finish his homework willingly every day.